Besse and Ghafari had some after-the-whistle stuff, McGuire for roughing. 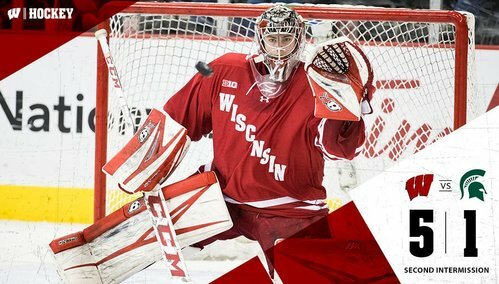 UW kills off the Besse minor and teams are back to even strength. Five minutes gone by in the second with the Badgers up 3-0. 4-0 Wisconsin, 13:49 to go in the 2nd. BADGERS GOAL: It's Aidan Cavallini again, his second in two games, and it's 4-0 UW over Michigan State in the second. 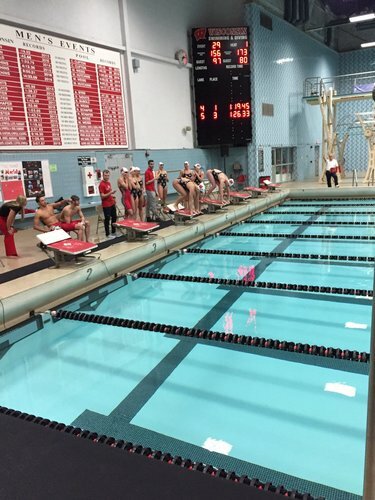 Another pool record falls as the Badger women take the 200 free relay in 1:30.26, shattering a mark from 2015. SPARTANS GOAL: Patrick Khodorenko scores on a 2-on-1 and Michigan State cuts UW's lead to 4-1. The last pool record of the day is broken in the men's 200 free relay in 1:19.45, demolishing Purdue's 2013 mark. Patrick Khodorenko gets the Spartans on the board! It's 4-1 with 12:59 to go in the 2nd. Spartans get one right back to cut the UW lead to 4-1 with 12:56 to go in the second. The Khodorenko goal was unassisted and is his second in as many games. Peterson said pre race that she was hoping to go sub-30. She did that. BADGERS GOAL: Ryan Wagner converts a Hughes pass for a 5-1 UW lead in the second period. 5-1 Wisconsin, 9:58 to go in the 2nd. Wisconsin has scored five in all three games against Michigan State this season. Still half the game left tonight. 6:54 to go in the second period with the Badgers up 5-1. They lead in shots on goal 13-9.
.@BadgerMHockey reached 5 goals in 30:02 tonight. Last game UW quicker to 5: Oct. 29, 2011, when it took 23:03 in a 6-3 home win over Omaha. Off-setting minors assessed to both teams so it will be 4-on-4 for 3:11 to go in the second. Off-setting minors assessed to both teams so it will be 4-on-4 with 3:11 to go in the second. After 40 minutes, 5-1 Wisconsin. Teams back to 5-on-5 with 1:11 to go in the second. END 2: Wisconsin leads Michigan State 5-1. Cavallini and Wagner for UW in the second, Khodorenko for MSU. Wisconsin leads Michigan State 5-1 as the third period begins. Shots on goal 14-13 for UW. Badgers and Spartans back out for the third period with a 5-1 lead. Four shots on goal in the second by the #Badgers was a season low for a regulation period. Previous: 6, done four times. By comparison, UW had five shots on goal in the 2:58 of overtime last Saturday against Ohio State. 16 minutes left in regulation as the Badgers hold their 5-1 lead.